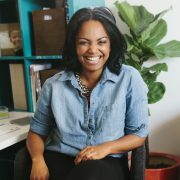 First, let me say welcome to the brand new AphroChic blog! I hope you enjoy the new site. You’ll find that things are more streamlined and organized on the new site. You can easily find our features, learn about upcoming events, and even click on our submissions link to find out how you can be featured on the blog. In addition, the blog finally matches the beautiful brand of the AphroChic Shop. I truly hope you love it, and if there are other ways that we can improve the new site drop me a line at aphrochicblog(at)yahoo.com. I would love to hear your thoughts! I guess with all of the changes going on here at AphroChic, and in the world of design blogs and magazines around the country, I couldn’t help but notice a change in one my favorite decor magazines, Elle Decor. Have you noticed it? I recently received the March issue and could not put it down. The all-star makeover of the home of Oprah Winfrey Show Executive Producer, Elle Rakieten, was by far my favorite article. Elle’s home, transformed by interior designer Nate Berkus and decorator Anne Coyle, graced the cover of the recent issue. With stripes, ikat, gold and glitz all in one, it is truly the most eclectic home I have seen on the cover of Elle Decor. The influx of more daring design and the number of beautiful spaces covered in this issue, signal to me a change at one our most iconic design mags. Rather than growing more conservative in times when magazines are going under every month, Elle is turning it up a notch. The spaces in this issue seemed more accessible (like, I could live there! ), more modern and playful, and featured designs that were out of the box. 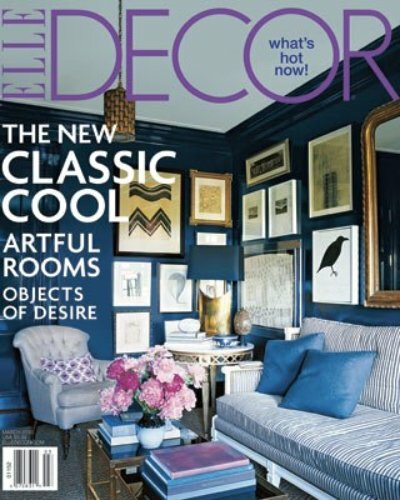 I am excited to see where Elle Decor goes next. Definitely get your hands on the March issue. I promise you will love it. https://www.aphrochic.com/wp-content/uploads/2017/02/Aphrochic-logo-glow-700.png 0 0 Jeanine Hays https://www.aphrochic.com/wp-content/uploads/2017/02/Aphrochic-logo-glow-700.png Jeanine Hays2010-02-16 16:36:002010-02-16 16:36:00Elle Decor Reinvented?